I don’t know about you, but I get chills every time I see a large transportation vehicle in a position other than it was intended to assume. For example, the pictures of the Costa Concordia on its side off the coast of Italy is a disturbing picture for me. And it’s a sad story. When the tragedy was first reported, all fingers pointed to the ship’s captain. Initial reports suggested that the captain had “stumbled into” a lifeboat, while most passengers and crew were still on board. More recent reports have suggested that the captain may have stayed on the ship longer than initially thought. The truth appears to be unclear. The captain is facing charges, since it’s an international crime for a ship’s captain to abandon his vessel. It may be a while before we know the final outcome of this sad story, but one lesson we can take away from it at this early stage is this: don’t jump to conclusions. Particularly in this age of overwhelming quantities of information, it is altogether too easy to draw a conclusion about a person or situation before all the facts have been unveiled. Of course, this doesn’t just happen with news stories, or even community events. Sometimes, it happens right in the church. One of the greatest challenges to the growth and health of the Christian church is that very human temptation faced by each of us: gossip. I’ve seen guests decide against a return visit to a congregation because, before worship, they clearly heard gossip, and even slanderous talk (! ), coming from congregants. It’s a great habit and discipline to learn how to speak well of others, and to have a positive attitude. Part of the blessing of that is the whole ‘honey attracts better than vinegar’ concept, but more importantly, speaking well of others fulfills an aspect of God’s will for his people: “Whoever pursues righteousness and unfailing love will find life, righteousness, and honour. Watch your tongue and keep your mouth shut, and you will stay out of trouble. Mockers are proud and haughty; they act with boundless arrogance” (Proverbs 21.21-24, NLT). I’ll be interested to see how the captain of the Costa Concordia comes out of this tragedy, but more importantly, I will love to watch God’s people speaking well of others. Try it, and see what happens in your church! Colossians 1.15-23 lays the foundation for the apostle Paul’s encouragement to the church at Colossae as it seeks to maintain orthodoxy. The Gnostics were trying to convince the Christians that the Gospel they had been given was insufficient, that Jesus couldn’t have really been God in the flesh. Paul states clearly that the good news is that Jesus is the image of the invisible God, and that in him all things hold together. In the message, I note that I was handed a sheet of paper before worship that would relate to my message. It was the concept of the laminin, a foundational protein that at the molecular level literally is what holds us together. I’ve copied a picture of it at right: it really does take the form of a cross! In Jesus, all things truly do hold together. Learn about the Gnostic heresy, be challenged to accept Christ’s Lordship, and listen to the message here. It was in the news this week that the Eastman Kodak Company, a name associated with photography for more than a hundred years, has filed for bankruptcy protection. 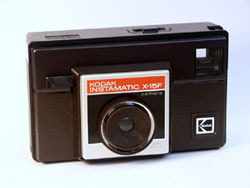 My first camera was a Kodak Instamatic. I remember getting the camera, and putting a 126 film cartridge in, and snapping away (with a flash bar, when indoors; remember those?). It was easy to use, and that appealed to more folks than just little kids like me. I still don’t know an f stop from a hole in the ground, as far as that goes, so if I were still using a film camera, my 126 Instamatic would probably be it. Anytime a major company takes this step is a sad time, but in Kodak’s case, it’s not only sad, it’s ironic. Why? Kodak not only pioneered the use of film in cameras; Kodak actually invented digital photography. Yep, it’s own invention caused what appears to be its ultimate demise. The company chose not to commercialize its big invention. Pundits suggest it is because film was Kodak’s ‘cash cow’, and it didn’t see the value in slaughtering the cash cow! To a point, this is understandable, but imagine if it had become the leader in its digital innovation the way it was in its analogue counterpart? Had Kodak maximized its potential with digital technology, it wouldn’t be in the pickle it’s in today. There is a lesson for God’s people in this sad story. The company’s philosophical decision to stick with the old approach to helping people capture memories hurt it badly. Too often, the church has been in exactly the same position, and has made exactly the same decision, and reaped exactly the same results. And that’s a sad story, too. Whether it’s in the adoption of Bible translations in the common language, or the use of projection technology to make worship gatherings easier to follow for guests and newcomers to the church, or the use of contemporary instrumentation in the accompaniment of congregational song, too often, the church has been among the “late adopters” – and sometimes, when the notion to adopt has come, it has been too late, and the doors have been locked permanently. Using modern Scripture translations, projection technology, and contemporary instrumentation doesn’t change the truth of what is proclaimed; it merely makes it easier to grasp. The gospel doesn’t change when we employ these things; it only becomes clearer to the modern participant. Many of us are naturally resistant to change. (Just ask me about my adjustment to my Mac computer.) But, as Cardinal Newman once said, “To live is to change, and to live well is to change often.” The church cannot look and worship exactly like it did a hundred years ago, even though it proclaims the same truth it did a hundred years ago. Does your kitchen look the same as it did when you were a kid? Probably not. Does it still serve in the preparation of food that nourishes you? Of course it does. When the leadership of your congregation makes a decision to bring about some sort of change, examine it carefully. If the change will make it easier for more people to grasp the amazing love of God in Jesus Christ, don’t resist it. Embrace it, for the sake of growing God’s kingdom. You won’t be disappointed. In this message, we begin a series on the letter to the Colossians in the New Testament. The first part of chapter 1 contains a great deal of thanksgiving, which is the focus of this message. Read Colossians 1.1-14, and listen to the message by clicking here. I know, it’s a long way from the second Monday in October, but there are many reasons to be thankful all year long. These days, I’m thinking about gratitude in the church and gratitude for the church. If you’re like me, it’s easy to take the church for granted: that the volunteers who serve will always do so, that the building will always be in good repair, that the ministry will always be excellent. Yet part of what helps the church be all it can be is gratitude – gratitude to God, and even gratitude to those who work with God to make the church all it can be in Christ. The apostle Paul wrote a letter to the church in Colossae, a city in what’s now Turkey. It was a declining city, but it had a growing church, thanks to the spade work of one of Paul’s converts, Epaphras. Alongside the growth, however, came theological attack: the church was being bombarded by those who believed the Christian gospel was wrong-headed and needed to be chopped down a notch or two. So in his letter, along with extolling the value of strong, firm Christian doctrine, Paul wrote to tell the church that he gave God thanks for it: “We always thank God, the Father of our Lord Jesus Christ, when we pray for you, because we have heard of your faith in Christ Jesus and of the love you have for all the saints” (Colossians 1.3-4, NIV). Paul gave thanks for the church, which was faithful in the midst of persecution. Pastors, do you give thanks for your church? Church members, do you give thanks for your church? God responds to our gratitude, and so do people. As Nouwen said, we are called to be grateful even when things are not rosy. The life of the church is not always perfect, but we are called to gratitude even when, on the surface, there seems to be little for which to be grateful. Yet there is much for which to be grateful. I am grateful to God for the church I serve. I am grateful to the church I serve! Be thankful, and be amazed at the response you will see, both from God and from God working through the church. In these days, like in no other time in living memory, does the church need our support and our gratitude. Be the church. And keep up the good work of being the church! Anytime we see an asterisk, we think we’d better read the fine print, right? So when we talk about our salvation being free, we know there must be a cost. And there is – but it’s not a cost to us. What, after all, is grace, if it’s free to us? Listen to this message, based on Romans 6.1-14, by clicking here. Today, the season of Christmas, which began on December 25, has come to an end with the celebration of Epiphany. Epiphany, which means “bringing to light”, is sort of the poor second cousin to Christmas: it doesn’t get much fanfare, but for people like us, it’s almost equally as important as Christmas. Epiphany marks the visit of the Magi to the child Jesus, as recorded in the first part of Matthew 2. What’s monumental about it is that it opened the floodgates for non-Jews to participate in the religious life of the people of God. Prior to the visit of the Magi, Gentiles were on the outside looking in. But beginning with the visit of those Persian star-gazers, it became possible for everyone who comes to Jesus in faith to be welcomed by him. Because those wise men followed a brightly-shining star, at great personal cost, you and I can enter the presence of the Lord and receive Jesus by faith. Do you see what I mean when I say that for us, Epiphany is almost equally as important as Christmas? As I read that poem this morning, the words, “uncontrollable mystery” leapt off the page at me. The fact that you and I can come to faith in Christ at all, to enter the presence of the living God, is “uncontrollable mystery”. There is much we cannot answer about our faith (that’s partly why it’s “faith”!). But this we do know: God, who is “uncontrollable mystery”, has revealed himself, unveiled himself, brought himself to light, in the Lord Jesus Christ. Through faith in him, we are welcomed into new and everlasting life. “There is neither Jew nor Greek, slave nor free, male nor female, for you are all one in Christ Jesus” (Galatians 3.28, NIV). As you pray today, ask God to bring to light even more truth about your relationship with him. And keep on growing.